Your dog is your best friend, and now you are taking a big trip somewhere and want to bring Fido, but you are looking for some advice on how to make the trip go smoothly while you are both in the car. Or maybe it has been a while since you have brought the dog anywhere and you are just looking for a refresher. Keep reading for some tips on how to make the trip go well! Make sure your car is clean of small objects, like pennies and socks. Before you pack up the car, it would not be a bad idea to vacuum it out, either. Bring Snacks. Like you, your dog will get hungry. While you may like eating grapes or chocolate, those can be bad for dogs. Instead, ensure that you have some dog treats up front for them. Consider getting a seat cover. Our friends at Bosak Motors Sales can help you with this. A seat cover can fit very well, and your dog’s saliva and fur will not be in the seat he or she was occupying after. A seat cover can also keep the seats clean of mud and other debris after you have taken the dog out for bathroom breaks and then taken him or her back into the car. Be mindful of if the dog is feeling hot or cold. You should not be leaving your dog alone in the car, especially in hot weather. And, did you know that the sun can hit dark-colored dogs even harder than lighter colored ones? 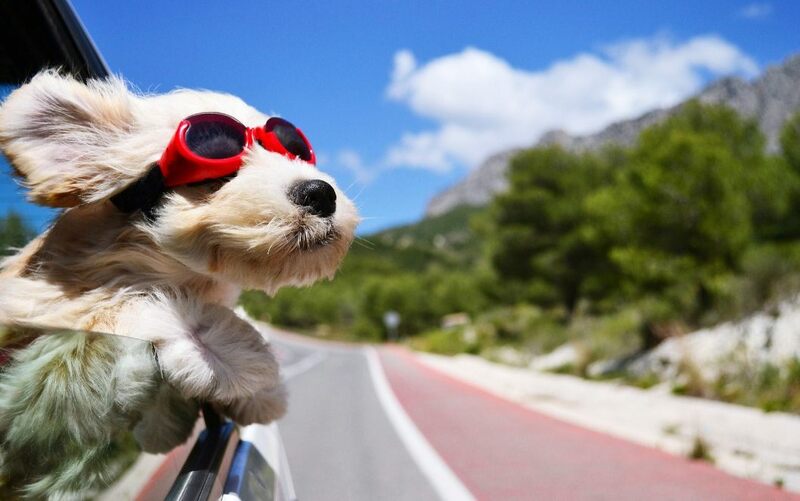 While driving, put on their air conditioning or open a window a bit to make things comfortable for the dog. In the winter the dog may like a blanket to keep warm. Bring ice cubes. Ice cubes will keep the dog busy, and will actually be easier on his or her stomach than gulping down water. Bring the dog’s own food. It may be easier to buy pet food during the course of your trip or once you have reached your destination, but you never know what brands, etc., you may find at stores away from home. For the sake of your dog’s stomach, and keeping your car clean, bring his or her food from home along. If your dog has not had much experience in the car, it is advised that you take him or her on a few short trips to break him or her into the car riding experience. When opening the car door, make sure that you have the dog’s leash on and a firm grasp on it. Your dog may just want to get him or herself out of the car, but you would not want your pet possibly running into traffic. For both parties’ benefit, make sure you have the leash on and you’re holding it before you get out of the car. Consider getting a safety harness and belt for your dog. They are easy to find online, and many pet supply stores sell them as well.